Frankfurt Airport (The biggest airport; frequent international flights). Train from Stuttgart Airport to Rastatt is about 1.5 hour. Sometimes there are also buses from Stuttgart Airport to Karlsruhe available. Usually you take the underground train from Stuttgart airport to the main train station in Stuttgart. Then you take the train to Karlsruhe (50 minutes). From there you can take a train to Rastatt (15 minutes). From Baden-Airpark there is no train. There is a bus or taxi available. 15 minutes driving to Rastatt. Most of the hotels are not far away from the railway station. You can easily walk. 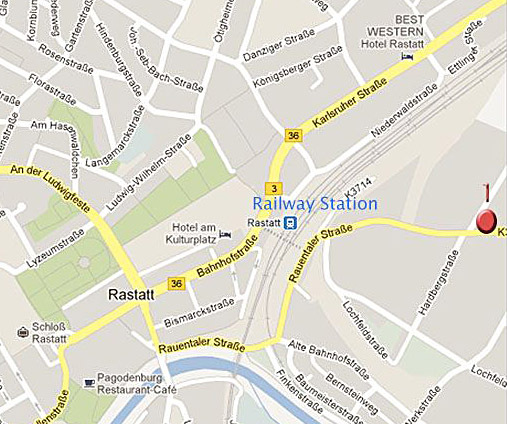 Have a look at the location map from Rastatt. Please be aware that we have no influence to these hotels, prices and service. The information at this page must be tentative and is just for your orientation! Please contact the hotel for details and prices. Adress: Poststrasse 2, 76437 Rastatt. Adress: Josefstrasse 7, 76437 Rastatt. The hotel is about 10 minutes walk to the ancient city of Rastatt. It has also a good italian restaurant. Kitchen, showers, toiletts are on the floor. Hotel is central, but very simple!